Josh Pfriem grew up in Seattle, WA., where mountains, water and beer dominate the landscape. It should come as no surprise then, that Josh developed a deep appreciation of all three, leading him to post-college stints as a brewer at Utah Brewers Cooperative, and Will Kemper’s Chuckanut Brewery before landing at Full Sail in Hood River, OR. It was a bike trip through Belgium, knocking on the doors of some of Europe’s greatest brewers, however, that cemented Josh’s ambition to meld European and Northwestern brewing traditions to create his own signature brand. 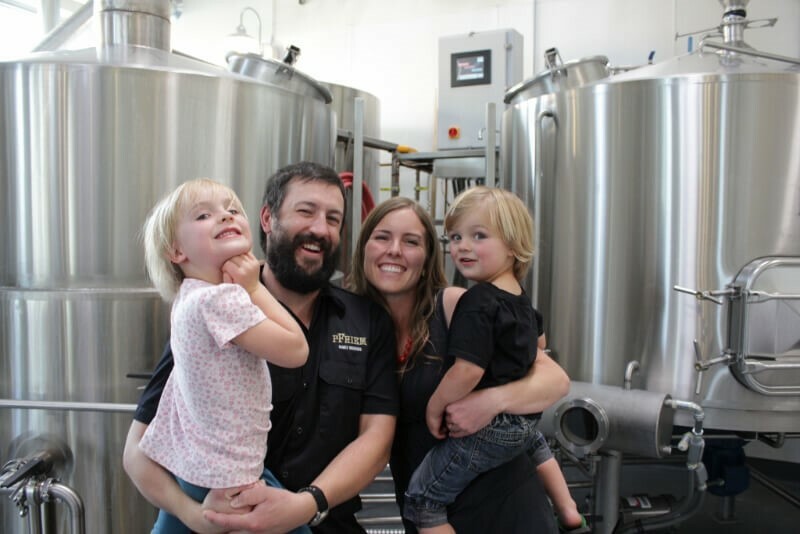 When not obsessing over pFriem Family Brewers’ 100-plus concoctions, Josh expresses gratitude for his friends, family, adopted home of Hood River, and the mountains, water, and beer that have given him the opportunity to be a part of something great. Although born in the Switzerland of America (Colorado), Ken developed his affinity for well-balanced beer and time-honored brewing traditions while living and traveling in Germany and Austria. With degrees in Physics and Electrical Engineering, Ken has done just about everything, but his happiest professional moments have come from helping to build pFriem Family Brewers while remaining true to the vision that started it all. He contends that there is only one thing better than cracking open an amazing beer, surrounded by people you love and that’s doing it in the midst of the Columbia River Gorge. Ken, his partner, and two children spend their free time exploring the Gorge on their skis, mountain bikes, and kite boards. Being born in the former Czechoslovakia, Rudy was no stranger to the kind of mountains, lakes and rivers (and crisp beers) that are plentiful in his adopted home in the Columbia River Gorge. Armed with a technical degree and an MBA, Rudy has felt fortunate to enjoy a successful career in business, but nothing has been as rewarding to him as helping build pFriem Family Brewers from the ground up and being around so many talented people who are passionate about what they’re crafting. When he’s not at the brewery, Rudy enjoys hanging out with his wife and two boys catching trout in the beautiful lakes that surround Mt. Hood. “2012 will forever be a benchmark year for the Pfriem family. After over a decade of award-winning experience in the Northwest Craft Brewing Community, I finally achieved a life-long dream of opening my own artisanal brewery in Hood River, Oregon. This dream never could have come to fruition without the help of my two esteemed friends and business partners, Ken Whiteman and Rudy Kellner, and the loving support of our respective families.